'Marrakesh' is the third installment in IO's 'Hitman', following 'Paris' and 'Sapienza'. It takes players to sandy Morocco where 47 must again take down two targets: a Bernie Madoff knockoff and a corrupt military official. The campaign of 'Marrakesh', called 'A Gilded Cage', is set in and around the Swedish embassy. Environments include a large open-air market, a defunct school converted into a makeshift military facility, and a series of tunnels and sewers beneath the area. It is probably the most ambitious and impressive of the 'Hitman' maps to date, containing huge amounts of NPCs and riddled with little alleys, dumpsters, impromptu weapons, and environmental distractions - all perfect for 47 to tinker his way through to his targets. The two previous missions have been a success in terms of allowing the player a great deal of control over the method of assassination. These can be quite creative and even comic, such as blasting a target out of a plane with an ejector seat during a routine safety check. Finding these objectives isn’t terribly difficult, as they can simply be toggled in the menu for 47 to track down from anywhere on the map, instead of occurring organically while exploring the area. Even so, it has been great fun, and getting that Silent Assassin rating for "accidental" deaths is still the delightful accomplishment it has always been. In 'Gilded Cage', IO tweaks that formula a little bit. The changes are immediately noticeable. Some opportunities are very tightly scripted to the point of feeling linear, such as trying to obtain the disguise of a freelance cameraman while he partakes of the hookah. There was less opportunity for creative thinking and more of the "sabotage this dirtbike to distract this waiter so you can get into the hookah bar, and that’s that, good luck finding a wrench". Try as I might, after a solid half hour of walking around the same bar (suspicious of itself I suppose, although no one bothered me until I tried to steal something), I could not come up with a better way to get in. I could pull the fire escape, but there are twenty customers in here and someone is going to blow the whistle on me. I could try to get the security guy into the bathroom, but he seems to have an iron bladder. Ultimately, it turned out to be ok; there is more than one way to skin this cat and 47 is very resourceful. 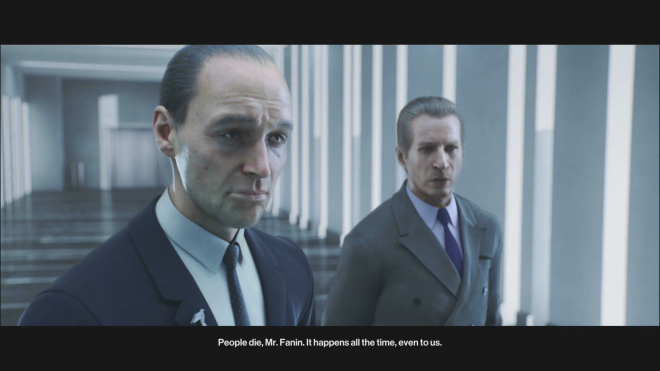 Stealth has often been in 'Hitman's wheelhouse and it is still very effective, but the disguises are becoming less important. I knocked out an unsuspecting embassy security officer (bald no less) and donned his duds, yet nearly every other officer in the embassy viewed me with suspicion. 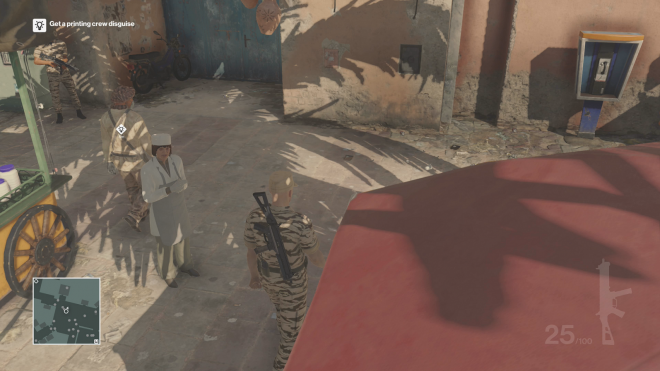 I get that security is tight in an embassy with rioters at the front gates, but having such limited mobility while disguised seems to water down the unique 'Hitman' effect. In Paris I enjoyed having the run of the fashion show with only a few suspicious guards here and there. It was still challenging to get the target alone or arrange an accident remotely, but I could at least walk through the kitchen in a waiter’s outfit without raising eyebrows. I should note that some of these changes aren’t bad necessarily; some serve only to raise the difficulty level. This is unsurprising as IO probably expects players of 'Marrakesh' to have familiarized themselves with the mechanics of 47 in previous outings. It also serves as an incentive to rack up points for the unlocking of boons in subsequent runs, like alternate starting areas, automatic outfits, conveniently placed weapons, and so forth. Even with the changes, it is hard not to like 'Marrakesh'. Getting into the embassy proper from outside, without a disguise, was particularly refreshing. I had to cross through some underground tunnels and a garage filled with soldiers, hiding from some, knocking out others, and stealing disguises when I could. The game changed once I stepped foot into the offices, and then again when I left the embassy. The second target, the corrupt colonel, is not as difficult to get to but he is more difficult to actually kill. He’s surrounded by his heavily armed subordinates and pays more attention to detail than the banker, not to mention he is a soldier and does things like not getting a massage during a nascent coup. 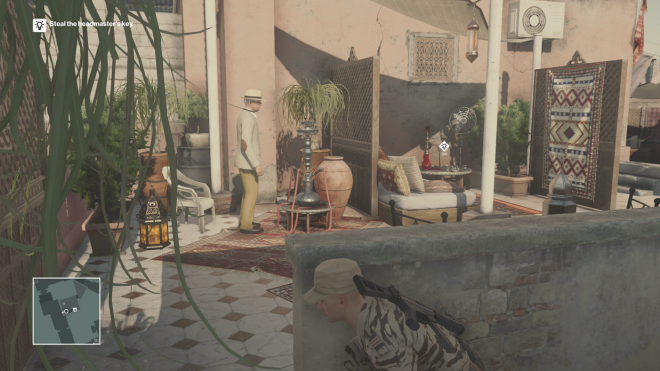 'Hitman's Marrakesh is very busy. It reminds me of the Chinatown level from 'Absolution', with all of the aggressive hawkers and fanny pack-toting tourists, but on an even grander scale. There are a lot of eyes on me in the market but it’s still possible to hide a weapon, steal something, or punch out a soldier in a dark alley, if I’m quick. There are minor issues with clipping and general video game weirdness, but all things considered, this is a great looking level for 'Hitman'. The voice acting detracts significantly from the immersion. 'Hitman' is a fantasy about being a methodical, professional murderer who travels to exotic locales and eliminates powerful people, and yet all of these Moroccans sound just like the Midwesterners who shop at my local grocery store. David Bateson is amazing as usual, as is the new actress for Diana. The music and sound effects are spot on and bridge the gap between a realistic portrayal of a frantic city and the cinematic quality of a big-budget game. I was interested in figuring out alternate pathways through the city, although less so than 'Sapienza'. The tightly controlled AI behavior is an obstacle, but the bonus options for multiple playthroughs open up different pathways and make for a more player-oriented experience. The usual side content that fills into the episodic framework is cheekier and more diverse than 'Gilded Cage', like Contracts and Escalation. 'Marrakesh' is a step back from the successes of previous episodes, but not dramatically so. IO seems to be experimenting with different playstyles that leave less room for debate, but the classic DNA of 'Hitman' permeates everything and I will have no problem coming back for the next round.